In The Night Garden – Projection mapping installation featured at White Night 2017 festival. The Night Garden grows out of a powerful dream vision inspired by the influential medieval poem The Romance of the Rose, by Guillaume de Lorris. I lay down one night, as usual, and slept very soundly. During my sleep I saw a very beautiful and pleasing dream. Now I wish to tell this dream, the more to make your hearts rejoice, since Love both begs and commands me to do so. And if anyone asks what I wish this dream to be called … it is the Romance of the Rose, in which the whole art of love is contained. And so, I dreamed one night that I was in that delicious season when everything is stirred by love. I saw a large and roomy garden, entirely enclosed by a high crenellated wall. No place was ever so rich with trees or songbirds, who sang the dances of love in melodies that were sweet, courteous and charming. Believe me, I thought that I was truly in the earthly paradise. I entered into the garden by the door that Idleness had opened. I won’t offer you a long fable about this pleasant, delectable place. For I could not recall all of the beauty and great delight. I went so far, to left and right, that I searched out and saw the entire condition and nature of the garden. And the God of Love followed me, watching me all the time, as does the hunter who waits until the animal is in good position before he lets fly his arrow. Nature, with consummate skill, had placed a fountain under a pine within a marble stone, and in the stone, on the border of the upper side, had cut small letters saying that there, the fair Narcissus died. Whoever admires himself in this mirror can have no protection, no physician, since anything that he sees with his eyes puts him on the road of love. It is here that Cupid, the God of Love, stretched his nets and placed his snares. Among a thousand things in the mirror of the fountain I saw rosebushes loaded with roses. None under heaven were as beautiful. Among these buds I singled out one rose, that was so very beautiful that, after I had examined it carefully, I thought that none of the others was worth anything beside it. And when I smelled its exhalation, I had no power to withdraw. When the God of Love saw that I had singled out the rosebud that pleased me he took an arrow and, when the string was in the nook, drew the bow up to his ear, and shot me with such great force, he sent the point through my eye and into my heart. Love selected another arrow. And a third. And a fourth. And a fifth. The first was Beauty, which could not be withdrawn. The second was Simplicity, worked in gold. The third, Courtesy, which sent me into a swoon. The name of the fourth was Company, fired at close range. The fifth, Fair Seeming, anointed with a precious unguent to relieve my pain. My wounds tormented me and urged me to approach. Even if I had seen it raining stones and crossbow bolts as thick as hail, still i would have found a way to make that rose my own – for Love, who excels all other things, gave me the strength and heart to perform his commandment. 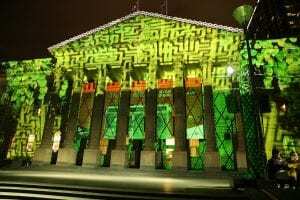 Nick Azidis is an Australian born new media artist and projection illusionist specialising in large-scale projections, in both digital and analogue mediums, and has compiled a diverse body of work over nearly three decades as a producer, content developer/creator and technician. Nick is interested in storytelling and creating eternal memories and changing viewer’s perceptions through his work, through image and light. 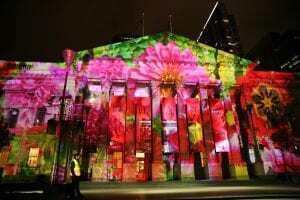 Nick has delivered projections for the Gertrude Projection Festival, Geelong Christmas program, Melbourne White Night, ANZAC centenary on the NGV, Melbourne International Music Week, Melbourne Biennale, and Australian Open Tennis championships. Since that time, his artistic investigations with projection have resulted in the creation of more than 1500 projection installations that create distinctive moods, atmospheric transformations, nostalgic and abstract forms. Based in Melbourne, Nick has worked throughout Australia, spanning major cities and also regional and remote areas. 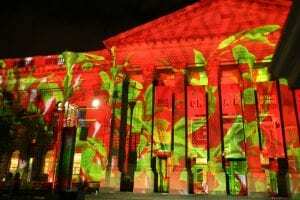 With 25 years of projection experience, Nick Azidis gains his original artistic inspiration from the streets and buildings of Melbourne city itself. Azidis creates aesthetically beautiful pieces that transform a viewer’s perception of their surroundings, with a blanket of luminescent designs. 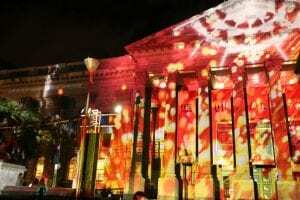 Nick’s love of projections and passion for lighting, as well as his technical skill, combine to bring a fresh visual perspective to every project. He has a strong work ethic and loves the collaborative processes and relationships he forms during a project. His ability to interpret creative ideas and create an aesthetic that serves the project is the fundamental basis of all his work.